Achieve the warm, romantic glow of candlelight, but without any smoke and fire risk. The marble design in wax has a subtle faux bois look. Paraffin wax, plastic LED housing. 2.0 Out of 5 Average Rating | 0% of reviews would recommend this product. 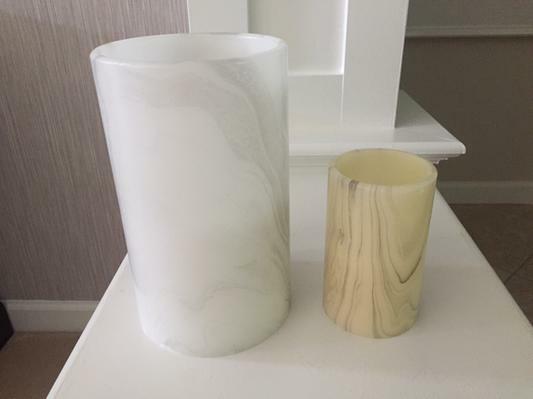 [value] => These are so pretty: white LED candles with grey marbling. I bought 2 of these to put in the Winthrop Lantern. Had them for about 2 months and they started to turn yellow. They are not in direct sunlight either. The candles completely lost their wow factor. I also have the 6"x10" one and that has remained white. 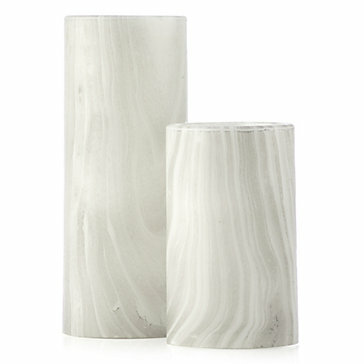 These are so pretty: white LED candles with grey marbling. I bought 2 of these to put in the Winthrop Lantern. Had them for about 2 months and they started to turn yellow. They are not in direct sunlight either. The candles completely lost their wow factor. I also have the 6"x10" one and that has remained white.